This was a great day for American tennis. In 1986, one American man, Tim Wilkison, had reached the Open quarterfinals. Four years later, there had been five American quarterfinalists. No American had been in an Open final since McEnroe, in 1985. Now, with Agassi having beaten Becker, the US was assured of having the men’s champion for the first time since 1974. The USTA was taking all sorts of bows for his renaissance, but it had almost nothing to do with it. None of the top young Americans were products of the USTA’s programs. One, Michael Chang, had benefited from some clay-court coaching from José Higueras, but that was it. The rest were products of their families, private coaches, and their own desires. The crowd didn’t care about any of that. It just knew McEnroe was on court. 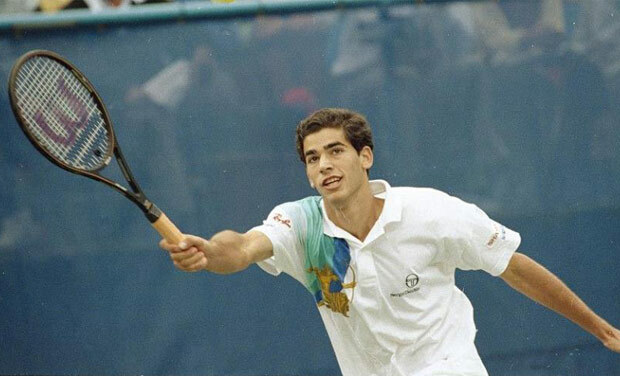 Sampras, who had been the hero Wednesday, against Lendl, was now cast in the role of villain. He was ready for it. In truth, it figured to be Sampras. He had played the match of his life on Wednesday to beat Lendl. On Thursday morning, over breakfast at Wolf’s Delicatessen, Blumberg told him that he had concluded a lengthy renegotiation of Sampras’ contract with Sergio Tacchini. The new contract was for five years and would guarantee Sampras at least $4 million, although it could go considerably higher if Sampras continued to improve. Having beaten Lendl, having become extremely rich, Sampras would have been excused if he had a letdown against McEnroe. It never happened, though. He came out bombing untouchable serves, and before McEnroe knew it, the first set was gone, 6-2. In the second set, McEnroe began to creep into the match. down a break, he broke back to 4-all with a miraculous scoop half volley. For the first time all day, the crowd was into the match. If it bothered Sampras, it didn’t show. He hit two perfect returns at McEnroe’s feet to set up a break point. McEnroe , trying to avoid another return like that, went too much on a second serve and double-faulted. Sampras calmly served out the set. What was happening there? How could McEnroe, who had played so superbly in his last two matches, be getting manhandled like this? In a sense, McEnroe was looking across the net and seeing himself, circa 1979: young and brash, supremely confident, and equipped with one weapon – the serve – that could keep any opponent off balance. The difference, of course, was in Sampras’ demeanor. He wasn’t bratty at all. He played one point, then another. No flash, no dash, no whining or crying. He was succeeding. Much as the crowd wanted to see McEnroe complete his miracle, it couldn’t help but marvel at Sampras. McEnroe did come back and win the third set, but even with the crowd now manic, Sampras didn’t wilt. He started the fourth set with his sixteenth ace of the day, broke McEnroe to go up 4-2, and served the match out, ending it with – what else ? – an ace. McEnroe walked off to one last huge ovation. He was disappointed but not devastated. Lendl had said that the key for Sampras was to forget he was playing John McEnroe. He had been able to do just that, largely, he felt, because he had played McEnroe earlier in the summer, in Toronto. Then, it had taken him a set and a half to forget who his opponent was and just play. This time, he had come out firing. He had beaten Muster, Lendl, McEnroe. The question now was, could he do it one more time?